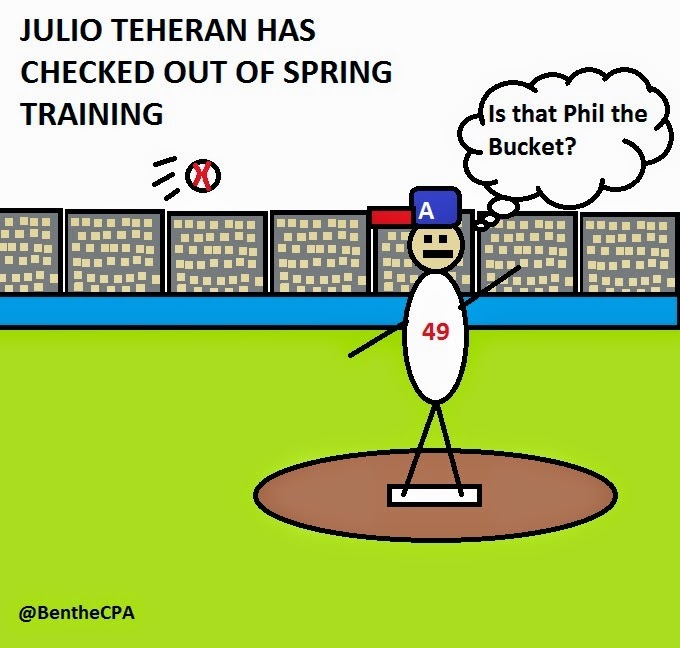 The Braves lost a spring training game to the Phillies 9-2, and Julio Teheran looked really bad in the outing. Julio's gotten knocked around for 18 runs (16 earned) in 18 innings. His ERA is an 8.00 and he's given up 5 homers. If this were the regular season, those stats would be eye-poppingly bad. But it's not the regular season, so slow that roll. Julio has usually been very sharp in spring when he was trying to cement himself as a front-line starter. Now? He knows he's the likely Ace of this team, and he's using spring training to work on his arm action. He's notched 15 strikeouts to go along with the 18 runs. He's working through his pitches and he doesn't care if he misses. Also, his head is already about a week down the road in the regular season. In short, Julio's already mentally checked out of Spring Training, and I can't really blame him. After the first couple of weeks, I think spring training is completely pointless for today's athlete. It's a vestigal event left over from the days when 1940s players would show up for camp fat and get into shape. Now? Million dollar pro players are in shape around the clock. Unless you are C.C. Sabathia stuffing your face with boxes of Captain Crunch to round out your figure. Constant articles get published every year around this time asking if spring training is too long. Those are stupid. Of course it's too long. It's like asking a person if their vacation was too short. Everyone is going to say yes. Why? Because Spring training as a whole is antiquated, and it exists now only because "it's always been that way," which is an actual defense of something dumb in baseball. It's why we didn't have true instant replay on calls until 2014, despite instant replay having been invented in 1963 almost 50 years prior. By that logic, baseball will let managers call the bullpen on smart phones in 2057. At that point Google will have invented technology that replaces managers with a random number generator and a set of spray charts. You know why I'm not worried about Julio? Because Doug Fister for the Nationals has a 7.02 spring ERA and has given up 6 homers. Matt Latos has a 7.04 ERA and given up 2 homers. CC Sabathia has an 11.52 ERA in spring right now. These numbers mean absolutely nothing. The pitchers are working on pitches, and they aren't looking at scouting reports. They don't care who is at the plate, they are just thinking about what pitch they need to work on, so they throw it. It's fire and forget baseball. You know what I like about Julio? He has good command of the plate with some strikeouts, he's not walking a ton of people, and he feels like his arm action is smooth by all reports. It's much ado about nothing. I would get worried if Julio was walking the ballpark. When your starter has problems finding the plate, THAT'S when you get concerned in spring. Not when guys are getting hits. So relax Braves Country. Julio is gearing up to mow them down in April. Just get him some runs to work with.